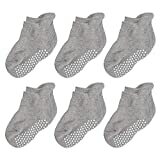 ANTI-SLIP DESIGN: Rubber non slip soles provide great grip and support for crawling/walking baby while keeping comfort. 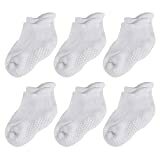 Your baby can wear these baby non slip socks without shoes when they are indoor. 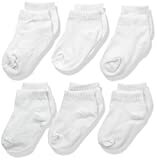 And these baby antiskid socks are very practical for the rapid growth babies.. 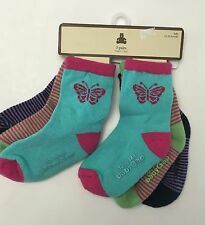 SIZE: Colorfox baby ankle socks are designed for baby between 6 and 24 months. Medium fits for 6-12 months baby; Large fits for 12-24 months baby. 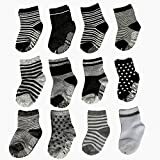 Middle thick or thin, fit all seasons..
MATERIALS: These baby ankle socks are made of 72.4% cotton, 25.8% polyester, 1.8% spandex, which would provide a comfy feeling for all the babies.. 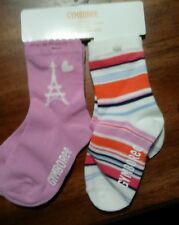 GIFT CHOICE: These baby novelty socks are great for baby showers, baptism ,gender reveal parties, birthdays, holidays! 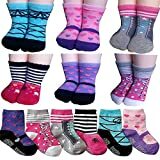 Let them become lovely babies with these baby novelty socks!. SUPERIOR CUSTOMER SERVICE: All Colorfox products come with 100% MONEY BACK GUARANTEE. 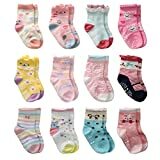 If you're not satisfied with our baby non slip socks, just return it to us within 30 DAYS along with your proof of purchase for a hassle-free full refund..
Toddler Ankle Socks, Colorfox Baby Boys Girls Novelty Non Skid Cozy Soft Cotton Socks for 6-24 MonthsMaterialHigh quality materials with more soft, breathable, stretchable and durable. 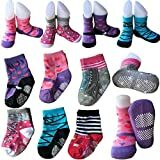 Middle thick or thin, fit all seasons.DesignThese baby socks would be a cool and fashionable accessory for your baby that looks perfect with any outfit!Soft and ComfortableOur toddler socks are stretchy enough to stay on baby's feet, and they won't squeeze baby's little ankles or leave marks,make your baby more comfortable and happy with our baby ankle socks.SafetyBaby's health and comfort always comes first.Our baby casual socks have following safety information.PH 7.2No chemical odorNon-formaldehydeNo decomposable carcinogenic aromatic amine dyesWater, crocking, saliva and perspiration color fastness tests are qualifiedYou can trust our Colorfox socks which are quite safe for your baby! Quality Guarantee! ON SALE for LIMITED SUPPLY. Satisfaction or get your money back. TOTALLY RISK FREE, why not give it a try ? 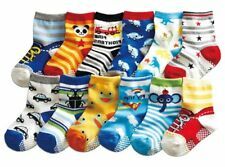 Non skid toddler socks. 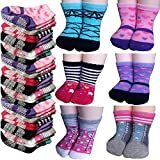 Package Includes: 6 Pairs 12-24 Months Baby Girl Toddler Anti Slip Skid Slipper Stretch Knit Socks + Gift bag + Gift Card, Stripes Star Footsocks sneakers Socks, Length 3.54inch/9cm - 5.9inch/15cm, Non skid toddler socks.